“England might have a chance, but I don’t know if they believe in themselves against Australia,” he said. As Iâ€™ve said in the past, I am excited about this Ashes – but am also much more relaxed about it. 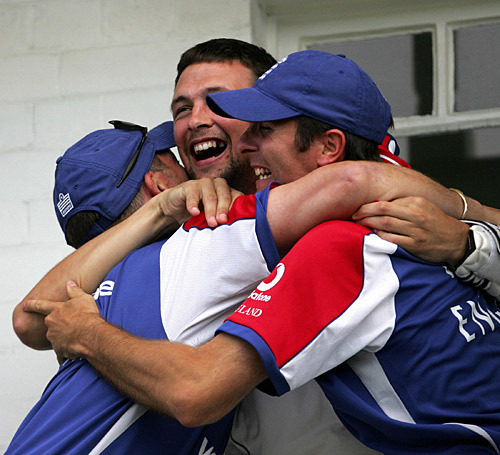 The past 3 or 4 have been painful to watch – really, really painful – not least because winning the Ashes was seen as the only way to resurrect English Cricket, back then. English Cricket isnâ€™t in the mess it was 5/10 years ago, and for that reason alone, England can at last try to enjoy this series and not worry too much about the outcome. Thatâ€™s Vaughanâ€™s motto, after all – â€œenjoy yourselvesâ€ – and Iâ€™m sure Australianâ€™s wouldnâ€™t begrudge England the odd victory in a few monthâ€™s time, although I donâ€™t doubt for a second which way they want the pendulum to swing for the final result 2-2 going into the final Test at the new and redeveloped Oval would be just fine, please. Can you smell the reserved “I don’t want to be too cocky, and please let England perform well” nature of my post there? I’ve received a few (8) emails and 28 comments from people disagreeing with my statement that this is the greatest series ever, so this review is a vague attempt to quantify it…but it’s more, simply, a review of another brilliant Test. Few can deny that the game we saw was brilliant theatre and a spectacular sporting occasion. At the start of the fourth day, England were without their trump card, Simon Jones. Remarkably, given his outstanding improvement this series, he wasn’t missed too greatly; a wonderful testament to a collective team effort, showing this England side never need rely on one bowler, or one player. In Duncan Fletcher’s terms, Matthew Hoggard “came to the party” and, praised by Andrew Flintoff, he bowled his best spell of the series. Earlier this month, I wrote a piece for Cricinfo on his importance to the England side, but I was worried it [the article] would soon lose its relevance. Thankfully, Hoggard did once again “sweep the shop floor,” picking up two vital wickets. Two, you ask? Two? Not a massive haul, granted, but they were the two most important. Michael Clarke had looked settled, and batted so well in the morning session. Hoggard got his away-swing working perfectly and, pitching it up he drew Clarke into a wishy-washy poke to grab his wicket just before lunch. It was a vital breakthrough. Clarke and Katich had arguably set the scene for an Adam Gilchrist batting bonanza. Indeed, Gilchrist’s intent was obvious, smashing two fours in quick succession. But Hoggard returned to trap him leg-before. Suddenly, Australia’s hard work by Katich and Clarke in the morning session had been thrown away. Their lead was futile, a handful of runs; but for another aggressive and brilliant innings by Shane Warne (how well has he batted this tour?? ), the target Australia eventually set would have been far lower than 129. One hundred and twenty nine runs to lead the series 2-1. I was very confident it would be a walk in the park, but my colleage at Cricinfo was having kittens. He was an absolute nervous wreck from the start. As I said, 129 wasn’t enough for Australia “barring a Shane Warne special,” and while England did reach their target, it was not without considerable alarm. Shane Warne, again, threatened to end England’s chances of winning the Ashes, with a performance to win over a thousand more fans. He is an utter legend and we’re so bloody lucky to watch him perform. The situation was just perfect for him – backs against the wall, defending a target of 129, he took Trescothick, Strauss and Vaughan’s wickets to leave England 57 for 3. It became 57 for 4 as Bell, unwisely, tried to hook Brett Lee. When Andrew Flintoff and Kevin Pietersen were dismissed, my nerves suddenly went into overdrive. “Damn you, Will, and your cocksureness!” I told myself. Geraint Jones followed, with a really dreadful smite off Shane Warne and suddenly, incredibly, England were 116 for 7. 13 to win. Three wickets left. Ashley Giles and Matthew Hoggard at the crease. How dare you give us another national coronary, England?! 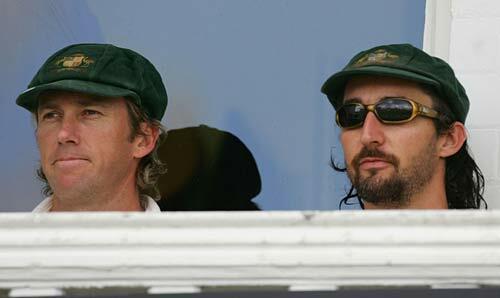 Giles and Hoggard saw England home in what Richie Benaud described as one the most tense matches he had ever come across. I suppose, arguably, England should never have let Australia in with a chance. But Warne is Warne, and if this series has showed us anything, it is the power of a chastened champion. I’ll do a blog and paper round-up later. 18 to win for England. 4 wickets to win for Australia. Oh. My. God. Pretty good effort by England to bowl Australia out for 387, but Australia showed plenty of fight. 129 is simply not enough, barring a Shane Warne special, for Australia…it was particularly impressive by England who were without Simon Jones, their trump card this series. This match is perfectly set-up. England start favourites, but Gilchrist is overdue a sensational innings, and Katich could do with a few. Comment away! So. England start the day on 229 for 4, with Kevin Pietersen and Andrew Flintoff at the crease. It’s very much in the balance, and the first hour will be yet another “crucial” session for both teams. Baseball’s benefits: what can Cricket learn? I was pointed to this excellent article, written by Martin Stabe, which has really got me thinking. He raises some interesting points about baseball and cricket; their similarities are obvious, but his emphasis on the importance fielding is worth discussion. Martin thinks cricket’s fielders look lazy and incompetent, compared to their baseball counterparts, and not solely due to the lack of gloves. I’m sure England have used baseball-style coaching methods in the past, but in these days of frenetic, manic cricket, surely a professional fielding coach should be called for? An error in the field might cost the fielding team just one run in both games, but while this is usually no more than a minor irritant in a cricket, itâ€™s a catastrophe that could cost a team the game in baseball. That, essentially, is the beauty of cricket, summed up in one fell swoop. While it might seem as though runs are meant to be made, and “mere singles” are perfectly permissable, saving runs has always been vital in cricket and is becoming more so in the modern era. We saw at Edgbaston, and indeed Old Trafford, in this summer’s Ashes that runs are painfully precious. The odd single here and there can just as easily, and tragically, cost a cricket side a game. Which only goes to emphasis the importance fielding now has upon cricket, and perhaps why more attention and time should be spent on practising its art. There were further signs of Australia’s fragile confidence, and slipping standards, as they failed to cling on to vital catches in today’s rain-affected fourth Test at Trent Bridge. Matthew Hayden, who in the past has always caught well, shelled one (in the covers? Or gully? Can’t remember) as did Mike Kasprowicz; both were relatively simple, as catches go, and both cost their side dearly. Had Australia taken two more wickets, England’s decision to bat first might have looked worse. At 229 for 4, it is England’s day – just. I was impressed with Shaun Tait, and surprised at his speed. He doesn’t tear into the crease like a man possessed, ala Brett Lee and Shoaib; his run-up is controlled, almost slowing-up as he reaches his delivery stride, before slinging his arm over ala Thommo. He’ll bowl on quicker pitches – perhaps the one at The Oval if selected – but even though he was sending down 94mph swinging exocets, I felt he could potentially get even quicker. Good signs for Australia – he swings it at pace, and late, too. But what about these no-balls? If ever anyone needs confirmation that a side is on a downward slide – and I’m not suggesting Australia will lose the Ashes – you only need to examine their fielding, no-balls bowled and catching. All three have been dreadful, all series. Today, Australia sent down 22; 11 by Kasprowicz, and 7 by Lee. Disgraceful – I don’t know how Australia’s fans must feel about this, but I’d be livid with rage. Totally unacceptable, and kept England’s scoring-rate ticking along nicely. Tomorrow’s papers ought to make interesting reading, for despite Australia’s fumbles England are still four wickets down. Flintoff and Pietersen both need to score freely, and make big scores; this is a 400 pitch, and England are 150 short at the moment. At the Alpha Blog, an Australian magazine, Dave is confident the Ashes are England’s for the taking. Not sure whether Dave’s an Aussie or a Pom, though (?). This blog seems to think there are no women who watch Cricket, which isn’t really very accurate. The only reason that Australia are still favourites to retain the Ashes is that England require a knockout to steal them. There is no other explanation for a day which began with a patched-up Australian attack winging down 18 no-balls in the morning session alone, but ended with a scoreline of 229 for 4 and honours more or less even. Ricky Ponting’s frugal six-over spell in the closing overs of the day, every ball a yard outside off stump or more, was an apt metaphor for the remaining exchanges of this series. “The Ashes are over here, boys!” he seemed to be taunting. “Come and get them if you dare.” Michael Vaughan dared, and toppled into the abyss in his over-eagerness. I did a gallery at Cricinfo, in case those of you didn’t get a chance to see any of it. Scott’s optimism is wavering – but on the up-side, he’s a Maiden fan! Always good to hear.